This year during the first weekend in May, I’ll make my annual pilgrimage to the Hill Country of Texas to participate in the Mo Ranch Men’s Conference. This is the largest gathering of Presbyterian men in the United States every year, and it’s become an important weekend of both fellowship and renewal for me. My dad will not be able to come with me this year, unfortunately. The years I’ve been able to attend the conference with him have been some of my favorite memories in recent times. I am going to share a workshop this year which continues the book and media sharing project, “Digital Witness 4 Jesus Christ.” Since most of the conference attendees are older men, however, it’s vital I choose a session title and focus which is not intimidating or scary. Otherwise (as I’ve learned in past years) not many men will come to the session. Wes Fryer is a follower of Jesus Christ in Oklahoma City. He is active in his church men’s ministry, kids ministry, and adult Sunday school class. He is an ordained church deacon and elder. He is a member of First Presbyterian Church of Edmond, Oklahoma. Wes’ background includes service in the US Air Force and work as an elementary school teacher. He is currently the Director of Technology for Casady School in OKC. Last night I added two more chapters to the #dw4jc project website, one for “eBook Quotations” and one for “Narrated Sketchnotes.” I’m going to also add one for Bible quotations, primarily using the YouVersion Bible app. In my Mo Ranch workshop this year, I think I’ll focus on the “Bible Quotations” and “eBook Quotations” skills, along with a little about why we should digitally share our faith. Rather than focus on “outside sharing” with social media, however, I think I’ll focus on “inside sharing” with family and friends. This builds on some ideas I shared in a secular / educational conference setting last Friday in Tulsa. 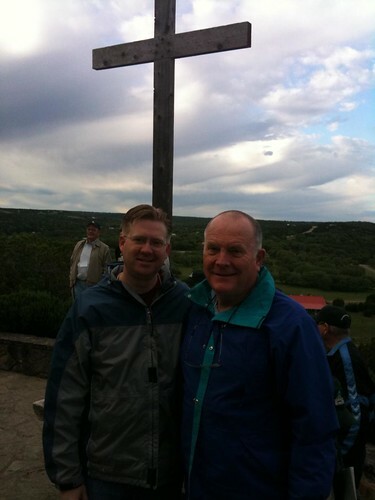 I’m looking forward to another spring weekend with other Christian men at Mo Ranch!